Empower Your Family Life with Feng Shui Secret Tips. 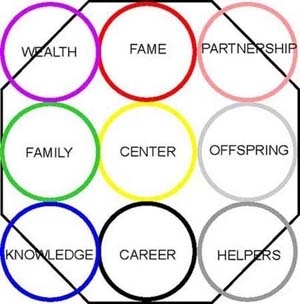 are represented in the family life situation on the Feng Shui Bagua Map. Being part of a loving family gives humans a great start in life. Yet this life situation is seldom perfect. "One challenge in my family was the constant need to create and maintain harmony between each person. It seems the logical answer would be to treat each other with kindness, compassion and respect. Not always easy though, is it? Sometimes our "familiarity" with one another seems to keep us stuck in ways of interacting that are contrary to harmony." These Secret Tips often don't appear logical. Your mind finds it hard to analyze or over-think them. This simple fact allows you to transcend problems and open new possibilities to improving your family life. One Feng Shui Secret Tip is based on the Chinese Zodiac. It is intended to improve compatibility between all family members. Another Feng Shui Secret that can benefit your family is The Moving Heart Meditation. My personal experience with the power of this simple visualization opened me to the possibility of healing my relationship with my father before he died. Locate your family life situation in your living space using the Feng Shui Bagua Map. Draw an entire floor plan of your home. It needs to be proportional and show each room. Orient the bagua so your main front door will be in the knowledge, career or helper area. What do you see? If you have a toilet directly in the Family Life Situation, it speaks to health and well being of the family being "flushed away". To remove this effect, simply place a full length, quality mirror on the outside of the bathroom door. With the door closed what you see reflected has now replaced the toilet on a transcendental level. If your floor plan shape is missing the area of family it could mean the ch'i of the family is low. You could experience this as a lack of closeness between family members. This energy may be changed by adding a bright solar powered light to the missing area with your intention to raise the ch'i. To empower your intention with any cure, perform the Three Secrets Reinforcement. The natural element for the family life situation is Wood and the color is green. If all you see is white in the family area then the element of metal is dominant. According to the Chinese five-element theory, metal chops wood. Is family unity being undermined by criticism? Are the children out of control? A simple solution is to balance the Feng Shui Elements by adding the colors red (fire), yellow (earth), black (water) and green (wood) to the white. See no problem in your family life situation? Great! Adding a healthy green plant with upward growth to this area will further enhance and empower your family. It is a beautiful reminder to develop healthy ways to grow and nourish one another. The dictionary defines family as "descendants of one common ancestor." Perhaps you have traced your own family tree. Many people gain a better understanding of themselves by researching their ancestors. Recently I hung a large mirror across from the foot of my bed. My intention was to see my path through life clearly. The wall that holds the mirror happens to be in the family area of the bedroom. As I looked in the mirror one morning I wondered if I could understand my ancestors in this view of myself. Most of my family is deceased and information is sparse. Perhaps it is possible to connect with my family tree through an objective observation of my reflection. It is an exciting theory I will explore. My definition of family is: "whoever is familiar, be it human, animal, vegetable or mineral. A family is the place where we always belong, feel safe and learn about unconditional love. This connection is held in ancient memories that often transcend bloodlines." Please stay in touch, and email me your questions.A personalized Feng Shui Consultation is empowering and affordable.